I love to discover a new flavor and try it in different recipes. One of the new flavors that we have been trying lately is Sriracha Sauce and we really like it. We have been spending a lot of time in our outdoor kitchen at the grill and this is one of the grill recipes that we have really enjoyed. This is a great marinade that could be used with any grilled meat but we love it with this chicken. This is a very simple recipe with very little prep time, the flavor heat in the recipe can be adjusted to suit your personal taste. In a mixing bowl mix the olive oil, sugar, Sriracha Sauce, Chili Powder, cumin and orange juice, mix well. Pour 1/2 of the marinade into a plastic bag and place the chicken breast into the bag of marinade. Let the chicken marinate for at least 4 hours. Remove the chicken from the marinate and grill until the internal temperature reaches 175 degrees. With the remainder 1/2 of the marinade, put in a small sauce pan and heat until the sauce begins to thicken. Drizzle the sauce over the chicken and serve the sauce on the side. Thanks so much for stopping by today, hope you enjoyed this awesome Grilled Sriracha Chicken. Hope you are having a great week and come back to see us real soon! This looks great! My son puts sriracha on everything, he will want to try this! That looks just delicious! I've never even had sriracha sauce before. I've seen the bottle, thought about getting it, but scared it's hot! I may have to pick up some and give this a try! This looks amazing! Next time we grill some chicken, this will be on the menu. I am always looking for a new way to flavor those chicken breasts! Looks great. Helen, this looks WONDERFUL! What a perfect entree for summer. This is a delicious grilled chicken dish, full of flavor and it looks amazing. Thanks so much for sharing with Foodie Friends Friday party this weekend. Pinning/sharing. This looks amazing, Miz Helen! I am a big sriracha fan and we have been grilling nonstop! Can't wait to try this! This looks amazingly good, pinning it to my Yummy Recipe Board! Thank you for sharing at the Recipe Swap. I need to try Sriracha it looks awesome. 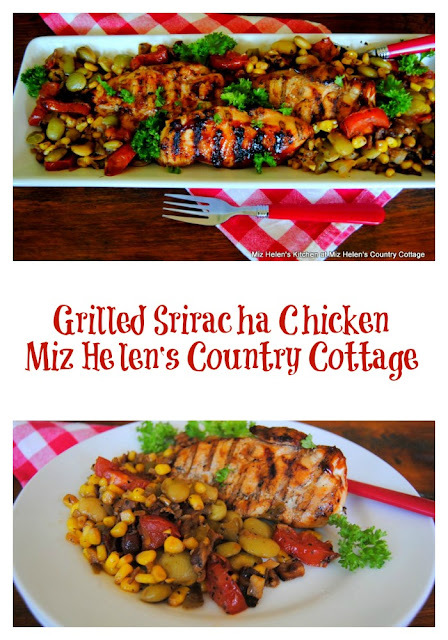 Your Grilled Sriracha Chicken sounds so delicious, Miz Helen! I haven't tried Sriracha yet - it's taking a bit longer to come to the UK - but your recipe looks and sounds wonderful. Thank you so much for supporting the Hearth and Soul hop. Sharing your post!